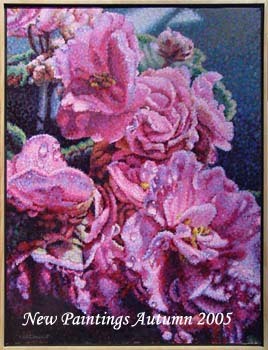 Welcome to the online art gallery of artist Eddie Mitchell. If you wish to view or purchase high-quality paintings that have uplifting, life-brightening properties, then you have certainly discovered the right art gallery. Eddie Mitchell's specialty is capturing the magical play of light and color as it is found in nature. While diverse in subject matter, the end result is always the same: Eddie Mitchell shows us that an exuberant light is always shining nearby. He brings it into our lives with his skillful mastery of color, light and shadow that illuminates any room or soul that witnesses it. His own inner light shines through in every painting, and Eddie is delighted to share his gift with us. Feel free to venture out and meet the artist at an upcoming art show. The light and vision seen in his art does not stop at the canvas, but permeates in each meditative moment for Eddie. 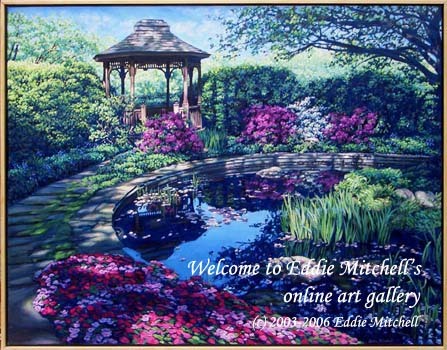 I am proud to display Eddie Mitchell's online art gallery for us all. Should you have questions or concerns with the website, please contact me via email at goddessdirect@adelphia.net.